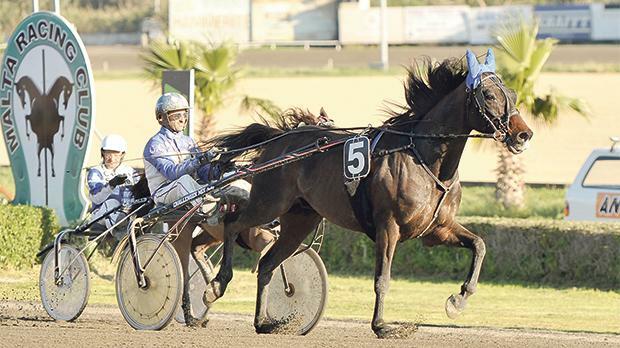 Swedish trotter Mad Neo, driven by Noel Baldacchino, won the Assikura Championship final at the racetrack yesterday. The class gold final was the major event in yesterday’s eighth meeting of the season which also included a class Premier race which saw September, driven by Clifferty Calleja, emerging victorious. Twelve horses took part in the class Gold final. It was favourite Remain Garbo (Charles Camilleri) the fastest horse early on, opening a small lead from Tom De Grez (Michael Ellul) and Ubu Du Metz (Rodney Gatt). However with 600m to go, Remain Garbo ran out of steam and was reeled in by a number of trotters, amongst which Mad Neo (Noel Baldacchino) and Tempo Boy (Clint Vassallo). These two horses sprinted neck and neck in the final straight and eventually it was Mad Neo which gained its second win of the year. Uther Paradise (Julian Farrugia) and Sultan De Renier (Patrick Spiteri) finished third and fourth respectively. At the end of the final, Andrew Grech, on behalf of Assikura Insurance, presented the winning trophy to Baldacchino and Angelo Bonello, driver and owner respectively of the winning horse. In the only class Premier race on the card, favourite September was unchallenged during the 2,140m distance. This French trotter managed to seal its second victory in a row easily by a length and a half from Power To Be (Charles Camilleri) and Royal De Vaiges (David Ellul). In the first class Gold race, Vikens Hot Lips (Jesmar Gafà) was overtaken midway through the final straight by U. Two Swing (Raymond Cassar) and Ton Reve L’Eman (Anton Cassar). Palazio Valterne (Noel Baldacchino) finished in fourth place. Swedish mare Warica (Rodney Gatt) dashed strongly from the outside during the last 300m of the second class Gold race. This mare registered its second win of the season from Supercool Langkjaer (Anton Pace), High Stage (Marco Refalo) and Ronson Cloc (Carmelo Farrugia). Another meeting will be held on Saturday, starting at 1.15pm.